photo courtesy of IB Participation, Inc. The Department of Marine Resources' Education Division provides educational services and materials to school children, teachers, and the general public. Staff are dedicated to developing a citizenry that has awareness and appreciation for the marine environment and its resources through programs at the Maine State Aquarium and Burnt Island Lighthouse. Professional development opportunities are available for teachers and the public. Information materials are available below or by request. 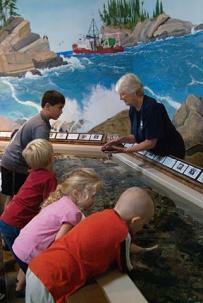 Field Trips - Plan a spring or fall field trip to the Maine State Aquarium. Teachers can request special programs or activities based on classroom needs or studies. (See Field Trip Information). Classroom Resources - Educational resources such as activities, lesson plans, and photographs are available on a variety of ocean-related topics. Email: aquarium@maine.gov. Classroom Animal Supply - For teachers with a saltwater tank in the classroom, the Maine State Aquarium will assist in providing live animals. Please call or email aquarium@maine.gov to request specimens. A limited supply may be available. 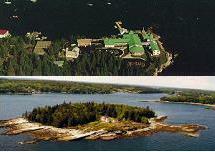 Teacher Re-Certification Workshops - Summer field courses and workshops are available at our Burnt Island facility. For more information, visit the Burnt Island page. These publications are available as free, downloadable PDF files, and may require Adobe Acrobat or Adobe Reader software (download here free) to view or print. Some of the files are quite large. Please contact us at if you need an alternate format. Teachers Guide to Marine Life in the Gulf of Maine - It features 24 animals with 4 pages of information and activities for each species including: classification, description, life processes, related species, and detailed anatomical diagrams.. Download the Teacher's Guide here free - pdf file, 110 pages, 2 MB. Gulf Of Maine Coloring Book - Illustrations of regional marine life are ready for students to color. Each page includes species identification and suggested colors. Download the Coloring Book here free - pdf file, 23 pages, 486 kb. A Lobster's Life Coloring Book - Appropriate for young learners, it provides simple illustrations and text on a lobster’s life history. Download the Lobster Coloring Book here free - pdf file, 13 pages, 5 MB. A Guide to Lobstering in Maine - This booklet provides information on the history of lobstering, lobster biology, and lobstering regulations. Download the Lobster Guide here free - pdf file, 24 pages, 1 MB, also available as web pages. 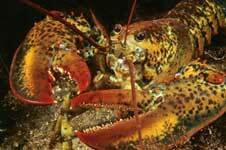 More information on Maine's lobster is available on DMR's lobster web site. Maine Saltwater Angler Guide - This booklet is a beautifully illustrated identification guide of sport-fish species. Download here . Download the Angler Guide here free - pdf file, 40 pages, 6 MB. The guide is also available to view as web pages on DMR's recreational fishing site. Green Gold: Maine's Sea Urchin Fishery - This booklet provides information on the sea urchin, fishing industry, and management practices. Download Green Gold here free - pdf file, 36 pages, 2 MB. Bigelow Lab "Hatch to Catch"
If you are interested in additional materials or information, please contact us. Also, please contact us if any of the above links fail.